We’ve just spent five weeks living in Valencia, and neither of us can remember a time when we felt so happy, so healthy, so well-rested, and so productive. I’m not going to give Valencia all the credit, but this cute little city certainly deserves a big bunch of flowers and a thank you card. When you search “Valencia” on Google Images, you’ll mostly see two things: photos of the City of Arts and Sciences, and photos of the beach. That’s because they’re both beautiful, and they’re also pretty much the only tourist attractions in the city. The Valencia Tourist Board might politely point to La Catedral del Santo Cáliz (a pretty cathedral), Mercado Central (a nice market), Jardines de Turia (a long and thin park that winds around the city and was once a river), and Plaza del Virgen (a meeting place for pigeons and people alike) as examples of the many attractions for people to visit, yet – while they’re perfectly lovely and interesting – they can all be seen in an afternoon and they don’t have the “OMGTHISISAMAZING” factor that you get in other cities. But a city doesn’t need to be a tourist attraction to be special. And Valencia really is special – just more in a “living” rather than “visiting” kind of way. It’s welcoming, friendly, unhurried and unclaustrophic. And it’s easy to do anything you might want to do when you live somewhere: get around to other parts of the city, buy groceries, hang out at the beach, work from a cafe, walk around, and eat good food that doesn’t cost a fortune. It’s amazing how many cities make stuff like that difficult. If you look at any of the tourist websites about Valencia, they’ll mention certain foods and drinks that are apparently staples of Valencian diets. Based on previous experiences of reading tourist sites and visiting cities, we thought this would all be codswallop: we assumed that the only people slurping down and munching on these (inevitably) overpriced products would be the tourists who realised they’d ticked everything else off the to-do list and still had a week left in the city. The Old Town (the prettiest bit with most of the “tourist attractions” and cute little restaurants) is small and easy to get around on foot. Bonometro: 10 train journeys within certain zones (you only really need zone A for most parts of the city). When you first buy a Bonometro, they’ll charge you a little bit more for the actual card; after that, you can top up the same card. Bonobús: 10 bus journeys within certain zones. As with the Bonometro, when you first buy a Bonobús they’ll charge you a little bit more for the actual card. You can buy it from newspaper stands and a wide range of shops around the city, as well as from Metro stations. TAT (Tarjeta de Abono Temporal): Unlimited journeys for 30 days (from the date that the first journey is taken) within certain zones. It can be used on the train, bus and tram. The buses and trains are clean and air-conditioned. There are little TVs on the buses which show the bus route map and where your next stop is. MORE THAN ONE PERSON CAN USE THE SAME TRAVEL CARD! (To give an example of what this means… if you buy one Bonometro, two people can use it to make five trips each – you both just tap the card on the reader.) I’m not sure why we found this so amazing, but it was just wonderful. All bus stops show how long it’ll be until the next bus. They also have QR codes: using them on your phone will display a live countdown to the next bus. There’s also a tram (which we only used once) and a public bike hire system (which we didn’t use at all). And they’re all perfect for working in: comfy seats, good temperature, great selection of drinks, friendly staff, nice vibe, not too hipstery. The best wifi cafes seem to be in the Ruzafa area. Our absolute favourite was Ubik Cafe – a bookstore/cafe with lovely staff, great music and a wide selection of food and drinks (including an amazing vermouth). Their daily food menu is sourced from Ruzafa Market down the road. The “menú del dia” was established during Franco’s time as a way for workers to get a nutritious meal at an affordable price. Today it’s offered by even the smartest of restaurants, yet costs significantly less than any of the meals on their main menu. You usually get one starter, one main and one dessert (from a choice of about three for each course), and you’re also served bread, a glass of wine (or soft drink) and coffee… all for about 8-10 euros. 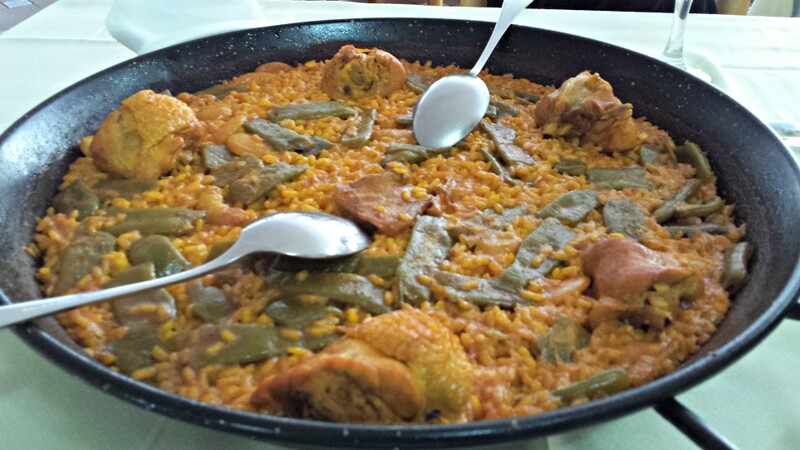 The menú del dia is served at lunchtime only – between about 1.30pm and 4.30pm. It’s one of the best things about Spain in general, but particularly in Valencia: the portions are massive and the quality is exceptional. In one restaurant, we had goats cheese and parma ham on bruschetta (Rob) and a tuna salad with olives and beetroot (me) to start, followed by octopus with paella rice (Rob) and a huge, herb-crusted steak with roasted potatoes (me) as a main, and then chocolate cake with vanilla ice cream (Rob) and watermelon (me) for dessert… with warm crusty bread, coffee and two glasses of wine. It came to 20 euros for two people. Younger people definitely speak English more than older ones, but the difference between Valencia and Madrid/Barcelona is noticeable among all generations. Which is great for us: we have no choice but to improve our Spanish. Almost everyone will try ever so hard to speak to us in English if they can. They’re also extremely tolerant of our attempts at Spanish: they don’t get grumpy or switch immediately to English if they can tell we’re trying to be understood in their language. In every city we’ve been to, we’ve had something to say about the dogs. There isn’t anything that remarkable about the Valencian ones (especially compared the the ones we saw in Budapest and Berlin), but we do think they tended to look very happy, content and smiley. Dogs are allowed inside most cafes and restaurants, and there are plenty of green areas for them to hang out in. So they have every reason to be happy. Someone needs to confirm this with us: is there a lot more sand than normal between the promenade and the sea? The beach just seems so… wide. Regardless, it’s beautiful. It’s a proper, kick-arse beach where you could spend the day sunbathing, swimming, eating paella and acting like you’re on vacation. We’re hoping to stay from January to March next year. UPDATE: We’ve booked! We’ll be there from early January to early March. If you’re tempted into coming too, let us know! We really got into Foursquare while we were in Valencia, and we now have our own list of our favourite places to go and things to do. You can see the list here. Posted on July 23, 2014 by Mish @ Making It Anywhere in Travel & accommodation. Madrid – the next destination for digital nomads?